When it comes to backcountry survival and bug out bags, one of the most confusing things is choosing a survival water filter. If you don’t understand what it treats or how it works, then you could end up with a nasty giardia infection and die of diarrhea. ​Or you might find yourself in a situation where you’re wasting valuable time waiting for water to filter. Thus, it is really important that you take the time to research the pros and cons of each choice before buying one for survival. The Sawyer Squeeze wins for its compact size, versatility, and affordable price. The MSR Guardian wins because of its ability to filter out viruses and ultra-tough durability. A lot of people use the terms water filter and water purifier interchangeably. While they are both water treatment systems, filters and purifiers are different things. A water filter mechanically removes pathogens from the water. Think of it like a really good sieve that is able to catch even the tiniest bacteria. Filters designed for survival will filter down to 0.2 microns. Some of the newest water filters can even filter down to 0.01 microns. The downside of these systems is that they don’t remove sediment from water. Sediment won’t kill you, but it is definitely not fun to gulp down sludgy water! What Do Water Filters Treat? 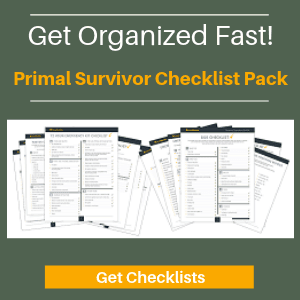 Good survival filters have a micron rating of at most 0.2. This allows them to catch all bacteria, protozoa, parasites, and some inorganic chemicals (such as heavy metals). You might not be able to see them, but trust me – even “clean” looking backcountry water can be ridden with pathogens! Even tap water can harbor pathogens, such as during power outages when water treatment facilities aren’t working. If you are really serious about survival, you’ll keep some of this in your BOB and with your survival supplies. The good news is that viruses usually aren’t a problem in backcountry water. Only cholera and polio are able to survive and reproduce in water (at least for now with the rise of superbugs), and even then the UV light from the sun usually can kill bacteria. Thus, a water filter is the best choice for most survival and bug out situations. They will give you safe drinking water in virtually all backcountry scenarios. If you suspect that viruses are a concern, then you can easily kill them by boiling the water for 1 minute. One more reason to have a survival stove in with your survival supplies! 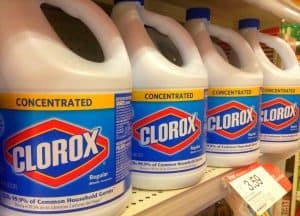 Alternatively, you can treat water with bleach to kill viruses, or use a water purification system. Before we get into the products, there are some terms you’ll need to know to make the right buying decision. Flow rate: This refers to how quickly the system can filter water. From personal experience, I can tell you that it is really annoying to wait 15 minutes for a liter of water! Micron size: This is how small of particles the filter can remove. Any filter for survival purposes should have a maximum micron size of 0.2. Cartridge life: Usually listed in liters or gallons, this refers to how much water the cartridge can filter before it needs to be changed. Backflush: Water filters can become clogged with sediment. Some filters are cleaned by “backflushing,” a process in which you spray clean water through the filter in the opposite direction. Prefilter: To prevent the main filter from getting clogged, a lot of filters have “prefilters” that have a micron rating of around 100. This gets out the big chunks of sediment and the main filter removes the small pathogens. If you don’t have a prefilter, you can always use a coffee filter or bandana for removing sediment prior to filtering. There are dozens of water filters on the market. Before you start looking at individual brands, learn about what types are available. Some are much more suitable for certain situations or groups. These are NOT suitable for backcountry survival. While some home water filters do advertise that they can remove bacteria, they generally have large pore sizes which allow bacteria, parasites, and protozoa to get through. 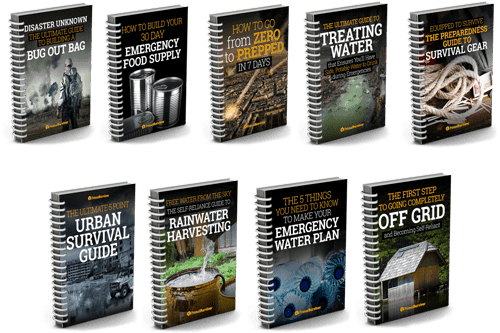 Only use these for treating hard water in your everyday life and do not rely on them for survival! Note that there are some exceptions to this though. For example, Berkey water filters (Amazon link) are made for home use but can remove bacteria, protozoa, and parasites. In an emergency, you could use a Berkey filter to filter pool water and make it safe for drinking. This is the type of filter my dad used when he took me camping as a kid. You put one end in the water source. A hand-operated pump pulls the water up and through a filter cartridge. Clean water comes out another end. Gravity filters have become more popular recently, especially for family camping. To use one, you put water inside a pouch, and then hang the pouch somewhere high up (like on a tree). Gravity forces the water down through the filter mechanism and clean water comes out on the lower side. 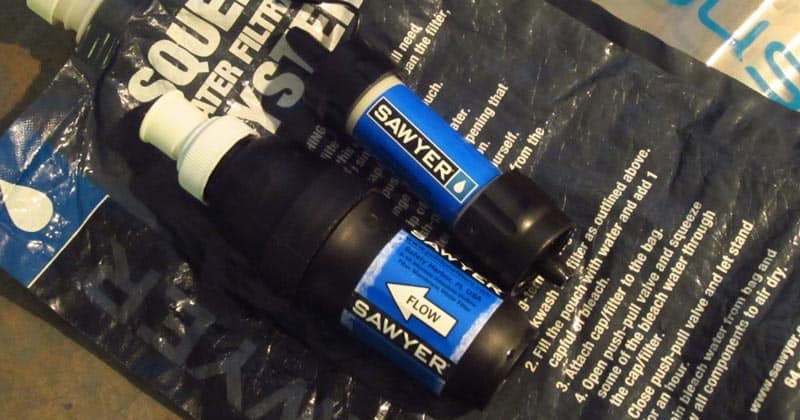 Ever since the brand Sawyer came out with the Mini (Amazon link), squeeze water filters have become a popular choice for survival filters. They work by putting water in a collection vessel (such as a pouch or a water bottle). Then you screw the filter mechanism onto the vessel. You then physically squeeze the pouch, forcing the water through the filter so clean water comes out on the other side. Because there is no need for a pump mechanism, squeeze water filters are incredibly tiny and lightweight. They are also very simple to use and can be adapted. For example, you can fit them with straws to drink directly from the water source or attach them to a water bladder to make a gravity system. Straw water filters were invented by a company who wanted to give people in developing countries a cheap, easy way to treat water. Instead of filtering the water and drinking it, you just sip the water directly from the source. Personally I DO NOT like straw filters because they don’t give you a way to collect water. For example, let’s say I’m in the backcountry and need a way to mix powdered electrolytes (an essential for your BOB first aid kit) with water. There’s no way to do this with a straw filter. Instead, I’d have to gulp the electrolytes and chase them with a drink from the straw. I’d much rather have a filter system which allows me to filter into my water bottle so I have clean water with me! The only way to make straw-style survival filters work on the move, is to put dirty water into your water bottle and use the straw to drink from it. But then you’ve got a contaminated water bottle, which could cause other issues. 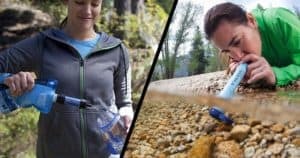 This said, a lot of people swear by straw water filters for survival situations, such as the Aquamira Frontier Pro (Amazon link) and the Lifestraw personal (Amazon link) and other Lifestraw family filters. They are cheap and very portable so worth considering. An important note: water filters will not remove taste and odors! The water can be 100% safe to drink and still taste like crap. I was camping with my family near a scummy pond and the water tasted disgusting. Luckily we had some powdered drink mix to add to the water or otherwise my 6-year old wouldn’t have drank it. In a life-or-death survival situation, the taste of the water won’t matter. However, it’s still a good thing to be aware of, especially if you plan on using your survival water filter for camping or backpacking too. For years, I used the Sawyer Mini as my personal water filter. I absolutely love it because it is so small and light. It comes with a pouch that you fill with dirty water and just screw the filter onto it. Squeeze the pouch and clean drinking water comes out from the filter. The only issue I had with the Sawyer Mini is that it filters really slowly. So, I recently switched to the Sawyer Squeeze. It is basically the exact same thing as the Sawyer Mini, but a bit bigger – hence the faster flow rate. To give you an idea, the flow rate of the Mini is 1 liter per 5.5 minutes whereas the flow rate of the Sawyer Squeeze is 1 liter per 2 minutes.As for treating water, the Sawyer Squeeze does a great job. It’s rated at 0.1 microns so will remove all of the pathogens commonly found in backcountry water. MSR is one of the leading names in backpacking gear and their filters are known for being high-quality. Their Guardian pump filter was initially part of a multi-million dollar research project by the USA military. They wanted a water filter which could be used anywhere in the world, under virtually any circumstances. One of the cool things about the Guardian is that it takes some of the filtered water and uses it to backflush as you filter. This means that the Guardian cleans itself as you use it, removing the need for manual cleaning. It won’t get clogged even when filtering really dirty water. Another really important feature is its 0.02 micron size. This means it can even filter viruses! Oh, and the Guardian filter is virtually unbreakable. You might think that this survival water filter is too good to be true. Well, it would be… if only it weren’t for its high price tag. When it comes to gravity water filter systems, the Platypus GravityWorks filter is consistently voted the best. The top reservoir holds 4 liters of dirty water and the bottom reservoir holds 4 liter of clean water, giving it a total capacity of 8 liters. There is also a 4 liter version available too. The system is designed to filter a lot of water in a short period of time. While not nearly as fast as the MSR Guardian, you don’t have to do any pumping for the GravityWorks. I haven’t had any issues with the reservoir bags breaking, nor do the reviews say anything along those lines. In a worst case scenario, if the bad did break, it would be easy enough to fix with duct tape. Here is another filter by Sawyer which is really damn impressive. It has a 0.02 micron rating. This means that it can treat most viruses – and is one of the only water filters capable of doing that! As stated before, viruses aren’t really an issue in backcountry water. If you do suspect viruses (such as if you need to treat flood water), then it is probably best to boil it. However, the Sawyer Zero Point One is a good option, particularly for those planning for urban survival. The Sawyer Zero Point Two works as a gravity filter. 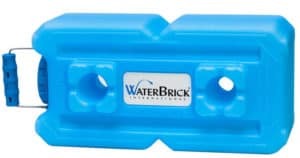 It can be used with reservoir bags (Amazon link)or used with an adapter kit (Amazon link). If you want a reliable pump-style filter but don’t want to fork out $300+ for the MSR Guardian, the Sweetwater Microfilter is a good all-around option. It is lightweight yet durable. It is small yet can still quickly filter water. You’ll like the design of the MSR Sweetwater too because its handle is actually long enough to use comfortably. When you are done filtering, just fold the pump handle down. The feature which really stands out with the MSR Sweetwater is that it has active carbon in its core. This helps remove bad tastes in the water. Note that the Sweetwater at 0.2 microns will not remove viruses though. The only thing that I really don’t like about the MSR Sweetwater is that you have to remove the cartridge to clean it. It will take a lot of clean water (about 3 liters) to get it thoroughly clean. Also, the cartridge life is fairly short. Incorrect. You don’t have to put the water in your bottle, you can drink straight from the source. Drinking from the source is mentioned earlier in the paragraph. That said, the wording could be clearer – I have amended that. Thanks for the heads up.